For anyone who’s gone through it already, you know the pain of going through that first Christmas without your loved one is unlike almost anything else. It was bad enough when you lost him or her. You didn’t think it could get any worse. Well, it really can’t….until you lose another loved one. But going through a holiday like Christmas for the first time without that special person, when so many memories are tied into that holiday, well, it can be one of the most emotional times of that first year. For me, there were a lot of moments during that first December without my mother, which brought not only a rush of memories, but buckets of tears and a lot of streaked makeup running down my face. Even when you finally start to get into the Christmas spirit a little bit, those memories sneak in and hit you where it hurts the most. But somehow the Lord always gives us certain “divine appointments” with others in similar situations who also need to know they’re not alone, and He sends them right into our path to make each of us feel a bit better. He certainly did that for me that first Christmas without my mom. Shopping that year was extremely difficult. There were so many happy faces, heading out to buy gifts for loved ones. I was missing my mother terribly, and the last thing I felt was happy. Although I’d always had trouble deciding what to buy for my mother, there were certain items I could always get her that I knew she’d like. And of course, in every store I went in that first year, there was something I started to pick up, thinking I’d get it for her. Then I’d remember, she isn’t here anymore, and it stayed on the shelf. 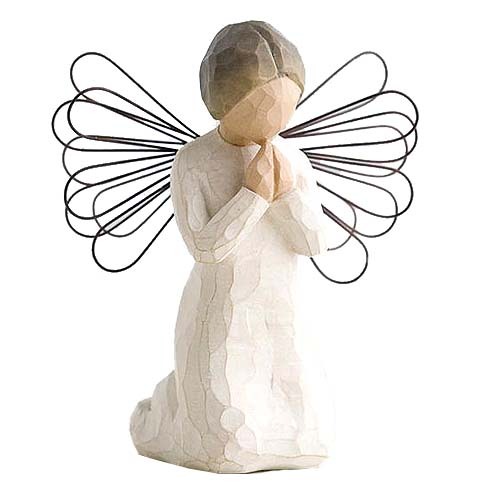 One evening when I was trying to shop, I overheard a lady in a gift shop talking to a friend on her cell phone about some of the Willow Tree angels she was thinking about buying. (I also collect them and had given several to my mother.) She’d made a comment to the store’s manager about how she could find the gifts she needed for her friends, but she just couldn’t get into Christmas this year. The Lord prompted me to speak up, and I said, “Neither can I.” She asked why, and I told her about my mom. Then she told me her husband had died two months ago, about the same time as my mother, and how much she was missing him. We talked about how we each felt for several minutes, and in that time, I knew I was ministering to someone who needed comfort more than I did. She tearfully made a comment about coming in the store to look for angels, and I told her we’d both found one. Both of us cried and ended up hugging each other, like old friends. I guess the people in the store thought we were a bit crazy, but I really didn’t care. We’d never seen each other before in our lives. Obviously we both needed to share our grief with someone we didn’t know, because Christmas is meant to be shared with loved ones more than any other holiday. Why I didn’t exchange information with her I don’t know. But I pray she has found her peace as well. How do we make it through one of the most difficult holidays during our first year of grief? Unfortunately there are no easy answers, no right or wrong ways to survive the season. Even now, after nine years, when I stand in the kitchen making cookies, or planning Christmas dinner, or writing out a Christmas shopping list my mother’s name isn’t on anymore, or hearing “Little Drummer Boy” or “Silent Night”, it still brings back bittersweet memories, as well as a few tears. May I never reach the point of not remembering. And may I always find someone new to share a bit of Christmas hope and love with, just at the moment they need it the most. This is one reason that GOD brought us together because of the love in your heart for your mother. I grew up with a mother who never expressed or shown any love in her heart for me. Your mother was a beautiful person and I always thought of her as my “adopted mother”. Yes I think about her too at Thanksgiving & Christmas time since there were so many wonderful memories while she was with us. We love you Rachel Chapman!! Thank you. That is so sweet…..you made me cry….